After Delia’s unexpected death, seventeen year-old Levi spirals into depression, unable to speak to anyone. When several attempts at therapy fail, Levi’s mom sends him from their home in Australia to Maine to live with his estranged father. Bitter, angry, and hopeless, Levi’s determined not to let anyone into his life, especially the girl who reminds him so much of Delia. For her part, Delilah’s content to let Levi to himself. He’s rude and erratic, definitely not the kind of guy she needs in her life. But beyond his angry exterior, she senses his deep hurt and finds herself powerfully drawn to the aching boy caged behind his silence. Crafting an angry yet likeable character has to be one of the hardest challenges in literature. While it was clear that Levi’s deep grief often motivated his surly outbursts, I found it hard to understand why Delilah was so captivated with him. It’s a pet peeve of mine, too, for a story to follow a romance between a hero with what could become abusive behavior (unpredictable, explosive anger.) While we’re supposed to know and believe in the ultimate well-meaning, sweetness of Levi’s heart, his behavior toward Delilah is, at times, disturbing. He never hits her or anything like that. But honestly, when a boy behaves the way Levi does toward Delilah, we tell her to lose that guy. All that said, I know we are supposed to root for him and want him to find healing. Certainly healing from grief is a journey, and it’s noble to stand by someone through that process. I think I just needed to see something admirable in Levi. Some reason for Delilah to invest besides the simple mysterious cause of his anger/grief. I don’t know much about selective mutism, though I’ve read a review on the blog Disability in KidLit of a book dealing with progressive mutism. (I’d be interested to see what they say about the portrayal in this book as well.) I liked that in Remember to Forget, it wasn’t a simple matter of Delilah being the one to break through Levi’s silence. I like that his healing came in layers, too. Though he struggles with continuing to take his medication, the meds do ultimately play a positive role in his recovery. Over all, this was a pretty simple, sweet story about a boy recovering from grief and learning to give himself permission to be happy again. As far as content, it’s fairly clean. See below for details. Aiden and Delilah take Levi to a party where teens drink alcohol. Delilah and Levi don’t drink, but Aiden does. Delilah and Levi leave him at the party. Levi takes several medications to manage depression and anxiety. He struggles with feelings about the medication and sometimes avoids taking it. Levi also smokes cigarettes. He eventually, he decides to quit. 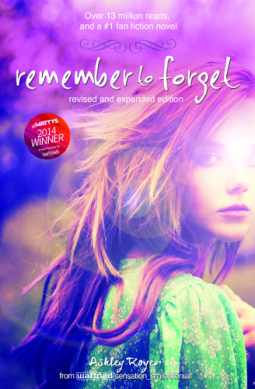 Tagged 2014 Watty Winner, Ashley Royer, Depression, grief, Mutism, netgalley, Remember to Forget, Zonderkidz. Bookmark the permalink.